Retrieving sunken spirits of viewers, though many had unfortunately left, was the brilliant Bharatanatyam recital of chiselled finish by dancers of Chennai’s Bharatanjali under Anita Guha. Nobody could have realized the ordeal of the troupe – having to don their costumes and regalia in a moving train running and travelling by road from Khurda Road station to Konark to take the stage in one motion for the recital, sans any rehearsal on the large performance area. Immaculate group spacing, co-ordination, and beautifully profiled central Ardhamandali stance, involved half a dozen performers including a lone male dancer, losing themselves in the dance, exuding an aura, permeating the large space. After a fitting start for Konark with Suryashtakam in Bowli (music by Neyveli Santanagopalan), Swati Tirunal’s “Bhavayami Raghu Ramam” followed as the varnam by the group performing without a cue missed. Following a crisp navarasa slokam, the Ramayana episodes unfolded, spirited Jatis linking the Saveri, Natakuranji, Dhanyasi, Mohanam, Mukhari, Poorvikalyani and Madhyamavati narrative sequences, with unimpeded flow in dance narrative. Each dancer donning a role for a fleeting moment gave it all the person had. Subtle aesthetics in dance treatment, with Rama’s role carried with dignity by Pavitra Bhatt the male dancer, scenes like Sita’s abduction, the breaking of the bow, exchange with the boatman Guha, the fleeting Setubandha scene with three dancers at the rear comprising the monkey sena with Rama, Sita and Lakshmana crossing the bridge in a line, emerged as flawless sequences - simplicity creating the impact. The Kapi Tillana provided a racy finale to an inspired programme with excellent music led by Anita Guha’s nattuvangam. “The celebrated Bharatanatyam dancer and choreographer Anitha Guha from Chennai brought her versatile disciples and stole the show with excellent choreographic presentations. The group dances were well synchronized, movements arresting, dancers of equal heights, thematic presentation of Vedachala and other sacred sites of Tirupati temple woven in a flawless manner, dancers performing joyously with clean geometrical lines of Bharatanatyam. The concluding teermanams executed artistically showed Anita Guha’s imaginative approach. The tillana danced by all in unison, offering a visual treat brought down the house. So different from dominating Kalakshetra bani, Anitha’s Bharatanatyam style left an indelible impression. That the form of Bharatanatyam can offer such variety was an eye opener for many in the audience. Anitha Guha’s works deserve to be watched in major national and international festivals. Though I have been watching dance for past forty years and more, it was only in January this year in the Music Academy’s dance festival at Chennai that I saw her work and was impressed and wondered how I had missed her work! Now that I have seen her work twice in different venues, I look forward to watching her troupe in other national festivals. “Very finished in the dancers’ movements, with commendable synchronisation, Bharatanjali Trust from Chennai run by Anita Guha gave one of the really flawless performances of the festival in terms of presentation and planning of the programme. After the sprightly vandana to Muruga and Ganesh, the Ardhanariswara Tandava, presented by two dancers one behind the other, was superbly composed — the perfect coordination between the two dancers, with minimal gestural language reflecting the tandava/lasya contrasts in complementing attitudes. Kudos to Anita! The Annamacharya kriti followed by Tulsi Das’ “Thumak Chalata” showed the animated performers getting involved in the mood of the items. From here on to a tillana in Kapi, the crisp programme with not a dull moment drew rousing applause”. “Excellent footwork, gestures and quick execution of narratives held the interest of the audience throughout the recital….. 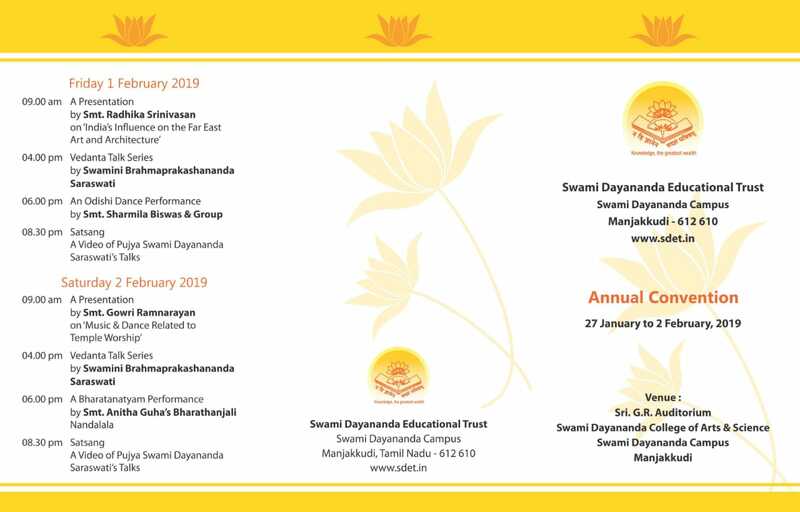 The students gave ample scope to bhava in the sancharis….. TheGajendra Moksham episode, which was presented to perfection, earned the young dancers many laurels”. “Vibrant journey of rasa and bhava….. The two-hour dance recital was an exceedingly structured combination of dramatics and Margam (narratives). All the dancers (32) exhibiting all aspects of abhinaya -- aangikam vaachikam, saaththvikam and aahaaryam -- turned each scene vibrant…..Anita Guha's voice intonation to bring out Lankini's fearful laugh deserves special mention here…..Next Lanka was perceived by Hanuman as one synonymous with riches and opulence. There was apt visualisation by the choreographer of the different types -- beautiful, ugly, tall, short, angry, calm, thin, fat and others -- of the rakshasis of Lanka…..Throughout the recital it was a sensitive journey of rasa and bhava all the while preserving the musical brilliance of the lyric and what stood out was Anita Guha's crisp and impressive choreography. “The life trials, betrayals and eventual redemption by the lord of prince charming Sundarar were pleasing potrayals…..The division of the stage into 3 parts each one alternately spotlighted sequentially served to unfold the story graphically….. The related manouevers, sancharis and jathis (Anitha’s innovative choreography) were quite artistic and traditional. 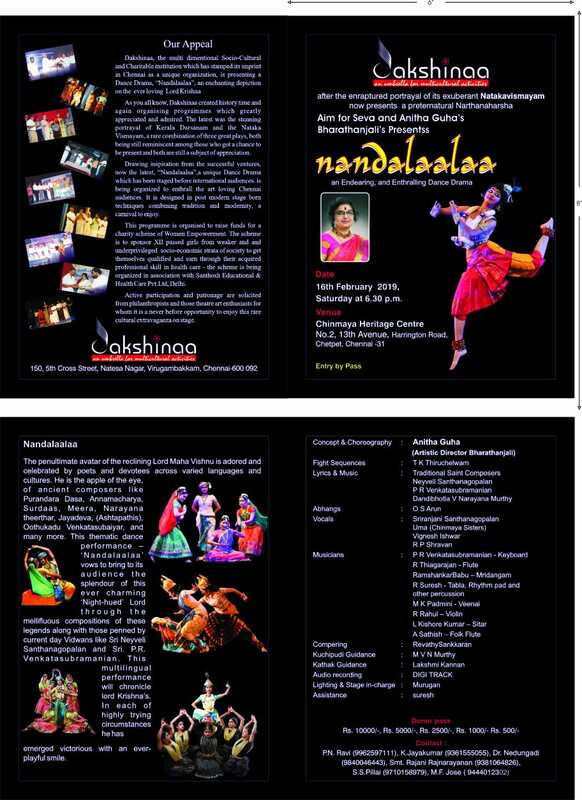 “It was a costume extravaganza with excellent settings and props…..The dancers including tiny tots who were used judiciously were extremely well trained and did their guru proud with their coordinated movements, good abhinaya and exceptional nritta, with every one of them maintaining perfect araimandi….. Kudos to Anitha Guha for the perfect training she hasgiven her students. Not once during the performances did one get the feeling that they were just students of various age groups. The experienced seniors as well as the raw beginners proved their metal at every step very professionally – a great asset to any guru. © 2019, Bharathanjali | All Rights Reserved Designed by Sahaniya Technologies Pvt. Ltd.